Bicycle Touring Around the World: Bike. Camp. Cook. Events! Tyler and I are currently in Illinois, staying with my family for a few weeks before the holidays. While we're in my hometown, I'll be putting on three different talks about my new bicycle touring cookbook, Bike. Camp. Cook. If you live in the midwest, or like long drives, I'd love to meet you! Here's a rundown of where I'll be and when. COST: $15 Owners / $20 Non-Owners. Pre-registration necessary. Want to add some excitement to your camp food repertoire? Join Tara Alan, author of Bike. Camp. Cook., as she shows you how to make self-supported traveling a delicious adventure. 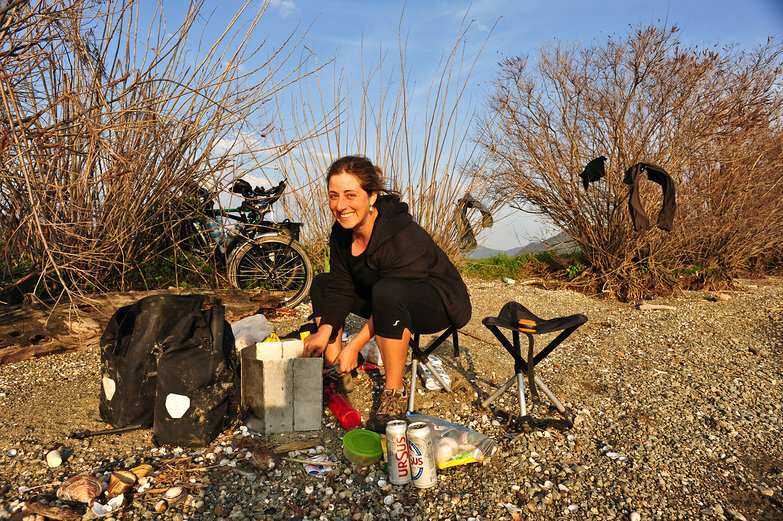 After you learn how to pack a rolling pantry, Tara will give a cooking demonstration on a one-burner stove, and you’ll come away with ideas aplenty for your next camping trip or bike tour. After years as head chef for a two-person cycling team, Tara Alan set about writing a cookbook for other two-wheeled wanderers. Her book, Bike. Camp. Cook. is the hungry cycle tourist's guide to slowing down, eating well, and savoring life on the open road. This will be a beautiful food-centric journey for everyone to enjoy. WHERE: Champaign Surplus, Champaign, Illinois. Stop by on Thursday evening, Dec 12 to chat with Tara about her adventures. AND, we're hoping that the newly minted cookbooks will arrive from the printer in time for purchase and book signing. Would be a very fun holiday gift for camp stove enthusiasts!